Coca-Cola has drastically increased its sales potential for its mini-sized promotional drink. Promotional Beverage Display Stand with advertisements on the sides are incredibly impactful. 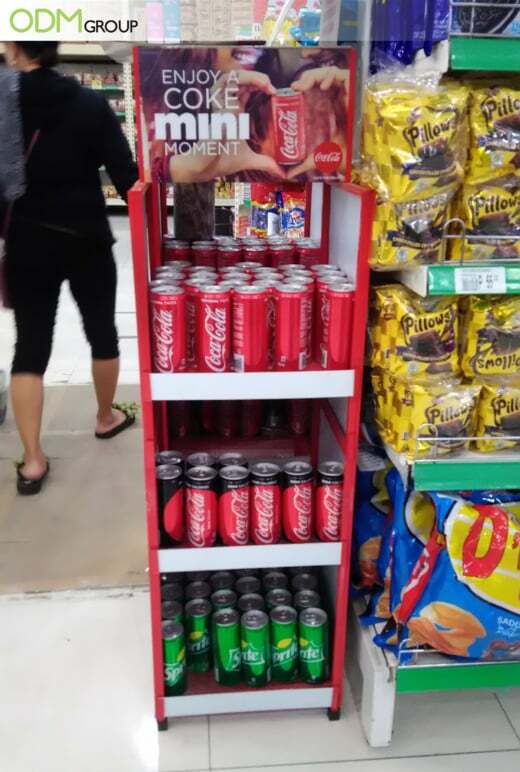 Customers would be able to see either the product or the advertisement regardless of where they are standing. This results in higher sales and profit margin for the company. 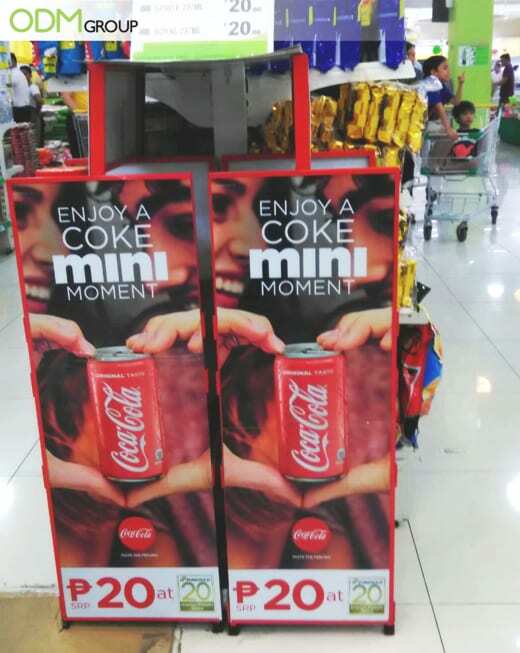 The above branded retail display example by Coca Cola was placed along the aisles to gain higher visibility. This is a good strategically seeing that the display is a bit shorter and narrower than other shelves. Versatility: After the promotional period, the beverage rack display could also be used for other campaigns. It would be easy for the company to reuse the displays for other products and events. They would only have to change the advertisements on the sides of the display. Convenience: The portability aspect of the POS Display makes it easier for the company to move the displays about. They could move it to a strategic location with high traffic or move it to another location for other promotional campaigns. Increased Visibility: The large advertisements on the sides of the display direct the customers’ attention to the product. It also boosts sales through impulse purchases as it entices the customers to purchase the products. Business people often said that every square inch of an outlet equals to money. The space needs to be strategically utilized to maximize sales. At the checkout counters, companies could still entice the customers to purchase products they had no intention of buying. This could be done by using attractive or custom POS Displays that demand customers’ attentions. Having said that, companies with bigger advertising budget could also invest in a customized promotional gift. This creates a positive and lasting impression on the customers. ODM specializes in creating high-quality promotional products. We would definitely be able to help you create the perfect promotional products and retail displays for your business. What are you waiting for? Contact us today so we can start working on your custom beverage display stand. An effective display has the ability to entice potential customers to purchase your products. It also comes in many, many forms. Continue reading this post to gain inspirations from successful POS Display case studies! Apart from promotional displays, promotional gift sets also enhance sales and brand awareness. Continue reading to find out more. Be the talk of town by customizing your promotions. Read on to understand what other companies did to outshine their competitors.